On Monday, November 4, 2013, Philippine Airlines, also known as PAL, made it's first inaugural flight to London, England for the first time in 15 years. The brand new Boeing 777-300ER aircraft left Manila and arrived in London around 3pm local time, and was welcomed by a traditional British water gun salute followed by a brief welcome ceremony. Most notably on-board was Ramon S. Ang, who is the president of PAL and San Miguel Corp. In a speech during the ribbon-cutting ceremony, Asif Ahmad, British Ambassador to the Philippines, commented: "Philippine Airlines is back in London after a gap of 15 years. Today, your flight was welcomed with the traditional water canon salute from Heathrow, the busiest international airport in the world." The non-stop flight, which operates five times a week from Manila to London, takes only about 13 hours and is big news for the 250,000 Filipinos based in the UK. Until now, there has been no non-stop route between the two cities. Roundtrip tickets are available for as little as $1,292 USD, but some introductory promo fares were as low as $442. 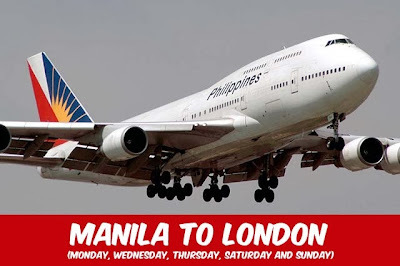 London is just the first of many European destinations that Philippine Airlines is planning to service. Others include Amsterdam, Frankfurt, Paris, and Rome.